Your master bedroom is not like any other room at home, it is your private place where you want to feel comfortable and happy without any disturb after a long day of work. Your master bedroom has to be cozy and functional with an elegant look to provide you with the atmosphere you wish for. 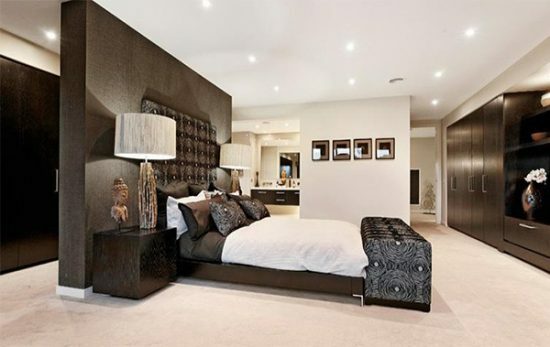 So what about going for a modern master bedroom design! The Modern bedroom is all about clean lines and minimal look; less is the best. So you need to remove any clutter inside the room. This will have a great impact on your mood while relaxing in your bedroom. Modern style cares about creating a beautiful and elegant bedroom with maximum functionality too. The room colors is a basic in any decor, the modern style tends to the darker hues of colors especially the earthy tones. But as it is your own bedroom you can reflect your personality by combine colors together you can go for dark red, beige or white as accents with these charming earthy colors. The modern bedroom furniture is always made of hardwood without curves. Wood is durable and elegant too with great finishes. The basic elements are a bed, dresser, nightstand and side tables, you can also getting more elements like chairs, sofa and mirrors if it is necessary and you have enough room space. As modern decor is simple and minimal don’t overwhelm the room with too much furniture, the design itself is simple and elegant too. 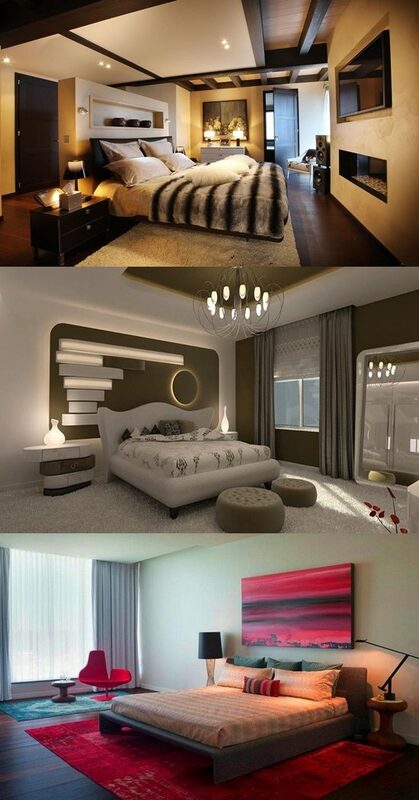 The light is an important factor too in the modern bedroom decor. You have to select the proper illumination with amazing light fixtures. With these right fixtures, you will be able to brighten up the overall look. Accessories are an amazing element to add your personality and add value to your room. you can add some elements like area rugs, beanbags, wall picture especially if it is personal and also some light accents are a great addition too. With these guidelines, you can get your dream modern bedroom decor. But if you need further information you can check online where you will be amazed at the variety of the modern decor ideas.